Is this an option for us? I know certain competitions don't allow it but it could really help us in ticking a few boxes around seats/ capacity issues. The whole of the tinshed might give us 500 seats but would still be used as standing only. If they are allowed not to. Much cost related here, could well be the answer anth good spot young man. 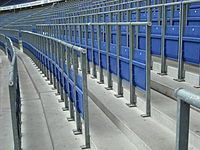 Went over to the PSV Eindhoven vs Vitesse game this weekend and the safe standing they have installed around the ground is fantastic. I really hope more clubs in the UK, like Celtic and Shrewsbury buy into this and do the same. You could drink alcohol in the stands, you were allowed to smoke aswell (both cannabis and normal cigarettes were aplenty at the game). I feel the English could benefit and learn a lot from these European ground regulations. I’d rather not have smoking anywhere near me to be honest, vaping too. Filthy habit. I certainly hope so, the current lack of standing space at Blackwell Meadow is a concern. AndyPark wrote: You could drink alcohol in the stands, you were allowed to smoke aswell (both cannabis and normal cigarettes were aplenty at the game). I feel the English could benefit and learn a lot from these European ground regulations. Imagine going to watch Darlo then walking home all wobbly. I couldn't imagine doing anything of the sort. Just saying that's all we smelt on Saturday night, was shocked to see how lenient the stewards were with them sparking up a big old joint. I just spent the full game with numerous pints. We should be keeping an eye on how the authorities view it with regards to the empty end. This is the only way it is useful for us anyway in terms of box ticking. The reason it's useful to Shrewsbury and the like is that you need to have plans for an all seated arrangement for the Championship or above, right? I dare say we won't be troubling that any time soon. It might help us navigate the need for 2,000 seats in the football league though, but i dare say that is a fairly distant problem right now also... I don't think 1,000 would be too problematic for the conference national (and we have a certain time to get that ready). We only need 500 seats for the Conference National, but with detailed plans showing how we can get to the 1,000 in the FL. This is where it may come in useful. As it isnt allowed in the premier league i think we should look at another option. We'd be there now if George's promise had come true! Why do we not get the warnings about standing on the grassy bank at BM open end like we used to get at Bishop? Don't think it is a priority for us at the moment with home crowds only about 1400 and still only mid table. Also any news on the community stadium or plans for the sports village? jjljks wrote: Why do we not get the warnings about standing on the grassy bank at BM open end like we used to get at Bishop? Don't think it is a priority for us at the moment with home crowds only about 1400 and still only mid table. Also any news on the community stadium or plans for the sports village? Hasn't gone that quiet, Johnston mentioned in Saturday's programme. What did he say Les for people who didn't read it? Vodka_Vic wrote: What did he say Les for people who didn't read it? Never been a fan of safe standing. i think it'll be a long time before we need to worry about such issues.